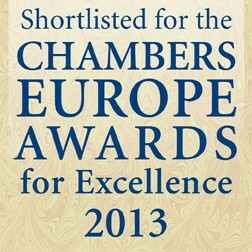 We have the pleasure of informing you that the law firm Domański Zakrzewski Palinka has for the sixth time been nominated for the Chambers Europe Awards in Award for Excellence category. Our firm was awarded by Chambers and Partners with Award for Excellence three times, in 2008, 2011 and 2012. The winner will be announced on 25 April 2013 in London.